When you get a Windows or General Protection Fault, Try This First! If you re trying to make changes to the data, or inputting data, make sure you re in the Edit mode. Check the message bar for the EDIT indicator. Check the message bar for a message. If the system is busy processing data, a message should be present indicating this process. Most processor-intensive operations will be pre-empted with a warning. If the system shows no messages, please wait three minutes, and if nothing has changed, reboot the system using the procedure described below. If the mouse has locked (will not move), please wait about one minute. If nothing changes (mouse still locked), then reboot the system, using the procedure described below. If you receive an error message, please document the error including what you were doing and what form you were using. Once documented, press the OK button, then close all forms. Send this error description to us via e-mail so we may correct the problem, or give further instructions. Since QuickVet is a continually developing management system, we would appreciate your assistance in determining where & why errors are occurring. Some errors may be due to a novice user learning how to use the system, and we can help by providing assistance if we are contacted about re-occurring errors. This procedure should be followed to restart the system, when any problem has occurred. If nothing happens, try pressing <Ctrl><Alt><Del> simultaneously again, and if nothing happens, wait one minute then press the RESET button on the computer case (i.e. Tower or CPU). 2. When the CLOSE PROGRAM dialog box appears, determine if any program listed in the box is followed by the statement (NOT RESPONDING). If you see this statement, mouse-click on that program, and press the END TASK button. Wait a moment, and an END TASK dialog box will appear. Press the END TASK button to terminate that program. 3. If the application shuts down, then shut down the system (Start Shut Down Yes). 4. Press the Reset button. 5. When the computer has booted up, restart the application. This procedure should be followed to restart the server, when any problem has occurred. 1. The AHMS or QuickVet must be closed on all workstations on the network. Verify this first, then proceed to step 2. 3. When the CLOSE PROGRAM dialog box appears, determine if any program listed in the box is followed by the statement (NOT RESPONDING). WARNING: Unless necessary, you do not have to turn off the computer. Pressing the RESET button will accomplish the same thing, called a cold boot. If it is necessary to turn the computer off, PLEASE WAIT AT LEAST TWO (2) MINUTES before turning the computer on. Both the hardware & Windows95 has a shut-down procedure that can be disturbed if the computer is just turn off then immediately turned back on. Typically, check the computer for any messages concerning the printing problem. If a message is present, press the HELP button or use common sense to correct. If there is no message, try pressing the Print button OR selecting Print on the menu AGAIN. If nothing occurs, verify by going to PRINTER SETUP that you are using the correct printer. If all seems correct, then reboot the system, and trying printing. Even as an experienced user, this problem does occur, especially when there are multiple users on the same computer. The User Name is NOT case-sensitive (it will automatically be entered in all CAPS), but the Password is Case-Sensitive. Verify that the CAPS LOCK mode has not been activated. On all keyboards, there is a indicator light for CAPS LOCK, and if this indicator is lit, you are in the CAPS LOCK mode. Press the CAPS LOCK key on the keyboard, which will take you out of this mode. Entering your user name and password should now work. This procedure is used to reconnect a workstation or deal with the basic problems you may encounter with your network. If this protocol does not solve the problem, please contact your network administrator. Cannot access network lock file. 1. Mouse click NO, since we need to re-establish the network connection to the server. 2. You will receive a gray screen with the message: ERROR, Could not initialize BDE. Network initialization failed. 3. Mouse click on OK. This will terminate the Animal Hospital Management System. If any other applications are running (Calculator, Word, etc.) please save any work, and terminate all other applications. 4. The desktop should now be visible, with all the icons (or minimize any applications so that you can access the desktop). Double-click on My Computer Icon (shown to the right). You should see icons representing the drives that are part of this workstation. Including the floppy drive (A:), you will notice the C: Drive, and IF you have a CD-ROM drive, a D: Drive. Do you see an icon that represents the server drive as on the right, and the description under this icon should mention the word, server? It should have the drive letter next in alphabetical order, so if you do NOT have a CD-ROM drive, this icon should have a D: designation. If this is NOT present, you will need to re-establish the network connection to the server. Mouse click the in the upper-right corner of My Computer Window to close it. Verify that the Reconnect on Startup box is checked. Mouse click on the OK button, and a window should appear showing folders and files from the server drive. Close that window by mouse clicking on the X in the upper-right corner. Double-click on the Network Neighborhood Icon (as shown to the right), and the Network Neighborhood window will appear. Verify that the server is on the list of computers on the network in this window. 0. Verify that the Animal Hospital Management System is NOT running on the workstation. 1. Mouse click on the Start button, and go to Find -> Files or Folders, and mouse click on Files or Folders. 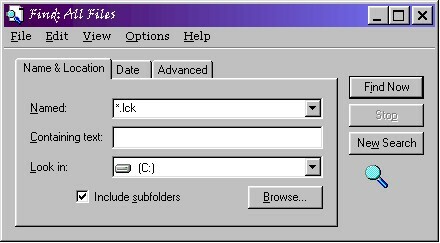 For Windows XP, go to START, click on SEARCH, and select ALL FILES AND FOLDERS. 2. Verify that you're searching the entire Local C drive! To delete the files, right-click on each file, then mouse click on the DELETE item on the menu that appeared. The Confirm File Delete dialog will appear, and mouse click on YES. Repeat this step for each file that appears in the window. Verify that the LOOK IN field is showing the Local C drive (as show above)! 7. Mouse click the in the upper right corner of the Find: All Files window to close it. 8. Now, you should start the Animal Hospital Management System with success. This procedure will assist you in restarting the network after a major failure. It encompasses many of the steps described above, so it s easy to accomplish, just a little more work. Press Ctrl-Alt-Del keys simultaneously once, and the Close Program Dialog box should appear. Verify that the Animal Hospital Management System is highlighted (and you may see a message next to it "Not responding"), and mouse click on the End Task button. The End Task dialog box will appear and mouse click on the End Task button. The AHMS should then close. After the AHMS is closed everywhere, shut down ALL workstations FIRST, then restart the server. Mouse click on the Start button, and go to Find -> Files or Folders, and mouseclick on Files or Folders. Mouse click the in the upper right corner of the Find: All Files window to close it. Restart each workstation, and perform steps 3 10 on each workstation. Restart the AHMS at the Server, and if successful, restart the AHMS at all other workstations. This procedure will assist you in resolving an 'Index out of date' problem with the system. This occurs when there's a problem with the network or one of the workstations/server when accessing the data. Go to Start -> Programs ->BWC ->Table Analysis or go to Start -> Programs -> QuickVet -> Table Analysis. If the Analysis appears minimized in the lower left corner; mouse click on the maximize button. In the Analysis window, look in the lower left corner to determine if it's started processing the data tables. If it's processing tables, skip to step 6. If the Analysis does not automatically start, highlight the Repair Only entry, and click on RUN JOB. The analysis will take approximately 2 - 15 minutes, depending on the size of the data for the practice. When completed, a dialog will appear stating how many tables needed repair, and all were completed. Click on YES to see which tables were repaired (search for 'fail' to find the tables). Report these tables to our support department via e-mail only! After closing the Report, an error may occur. Just click on CLOSE, then restart the system. Restart the server and resume normal operation. This procedure can be used to pack the tables (removing deleted record space), and to rebuild the indices for all tables. This should be run on an annual basis, unless recommended by our staff. This procedure should be run at the end of the day! Close the AHMS at all workstations BEFORE terminating the AHMS at the server. In the Analysis window, highlight the Pack and Rebuild Indices entry, and click on RUN JOB. The analysis will take approximately 2 - 25 minutes, depending on the size of the data for the practice.